Ideal for house,party decoration.You can hang it on the wall,door,window,Christmas tree and so on.It will be right at home! Glitzhome is a US registered trademark based on Texas USA. We are the professional designer and crafter of home decor products with more than 10 years'experience. Hope you could find your favorite items to add some fresh elements to your home. We assure that the item you received is 100% safe and sound. For any defective item, please contact our customer service for satisfaction guaranteed solution. 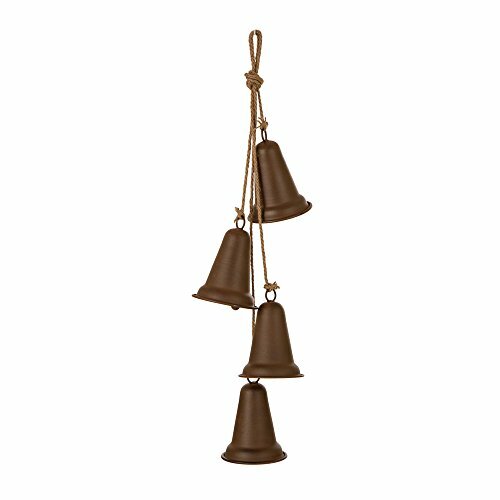 Retro country style design makes it more unique.Adorable bells ring perfect for hanging on window curtain,mantel,door and Christmas tree. Sure to bring much pleasure to your life and your friends with gentle sounds,creating a pleasant atmosphere and breathing life into your world for many years. Every time the door opens you will hear the bell sound.It will be like Santa Claus's sleigh close by. Great piece to celebrate the festive holiday.It also perfect for house training tool,you can know when your pet need to go out. Glitzhome offers different selections of Christmas decor,such as stocking holders,Christmas tree,yard signs and so on.Just kindly check our store and sneak a peek at most popular holiday decor.